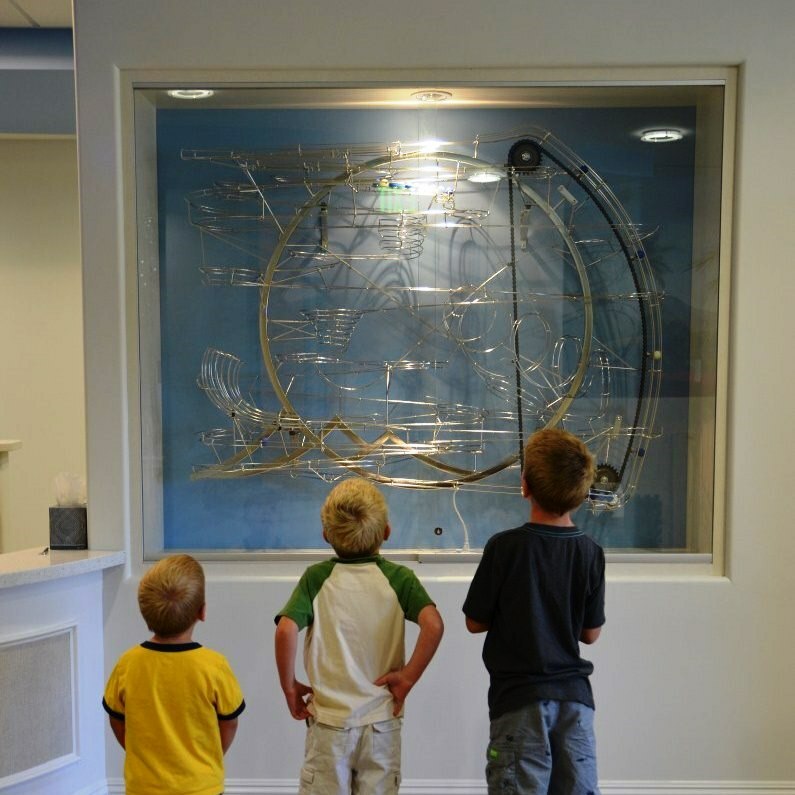 This sculpture is installed in the waiting area of Temecula Pediatric Dentistry in Temecula, California, and features a pinnacle event that occurs periodically and consistently throughout the day. As the track switches disperse the balls through the sculpture, every fourth ball lands in a ball queue at the top. Once the ball queue is filled with 10 balls, the 11th ball takes an alternate path to trigger the release of the 10 balls waiting in queue. One at a time, they zoom down the track and jump high through the air, landing in a basket and rolling on their way. Back at the top of the sculpture, the next ball arrives in the empty ball queue to start the cycle over. Other tracks send the balls through spirals and zooming around loops in constant motion throughout the day. 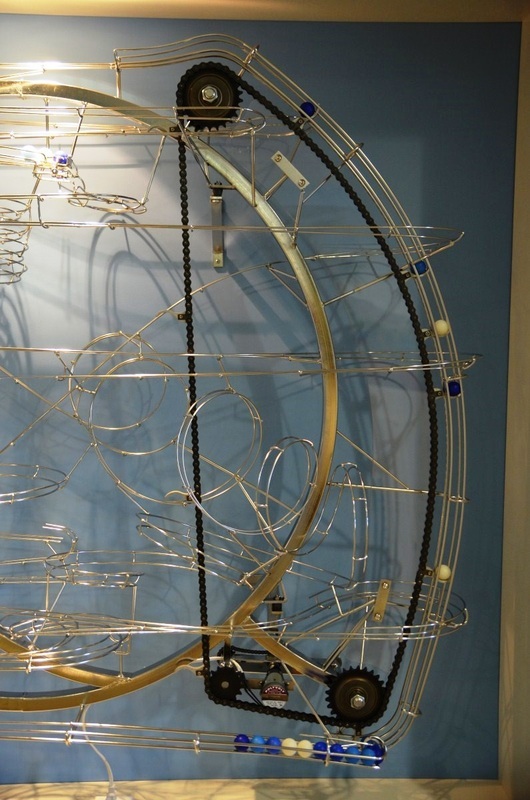 Other unique features of this sculpture are the curved frame and the curved chain lift. 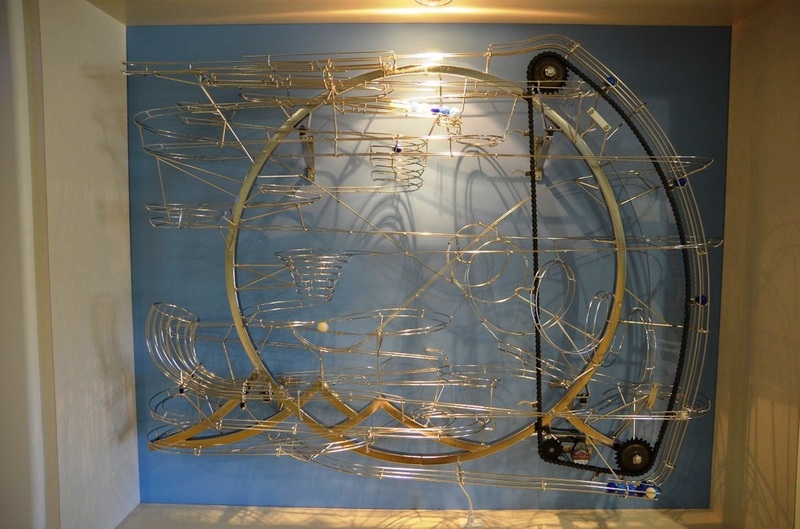 The frame is made out of bent and welded stainless tubing. The shape depicts a cresting wave and water lapping against a beach. The chain lift follows the shape of a cresting wave. Wall-mounted design, 48” tall, 60” long, and 12” deep. Continuously running during operating hours. Pinnacle event: after 10 balls collect on the track, they automatically release in succession to a jump over track and into a basket. Wave and water inspired structural theming. Unique curved chain lift designed to follow the curves of a cresting wave. The waiting area is an interesting place to be now. During build-out, a custom enclosure was built into the wall to house the sculpture. The sculpture is isolated from the walls with dampers to prevent the wall from transmitting the sounds from inside the case. The isolation system works great and hardly produces any noise. 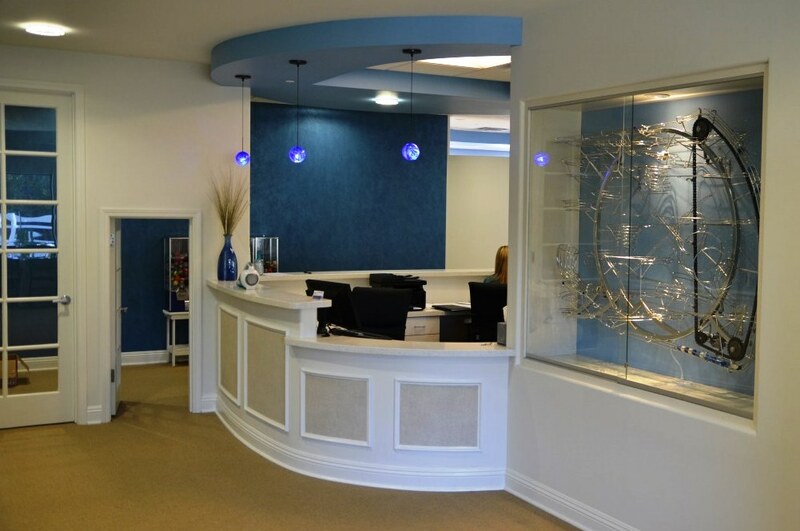 It is a great-looking and popular addition to the space. The Wave Rider Rolling Ball Sculpture mimicks the imagery of a wave crashing on a beach. Two balls jump through the air as a flurry of activity occurs during the pinnacle. Wave Rider's curved chain lift creates the shape of a crashing wave. 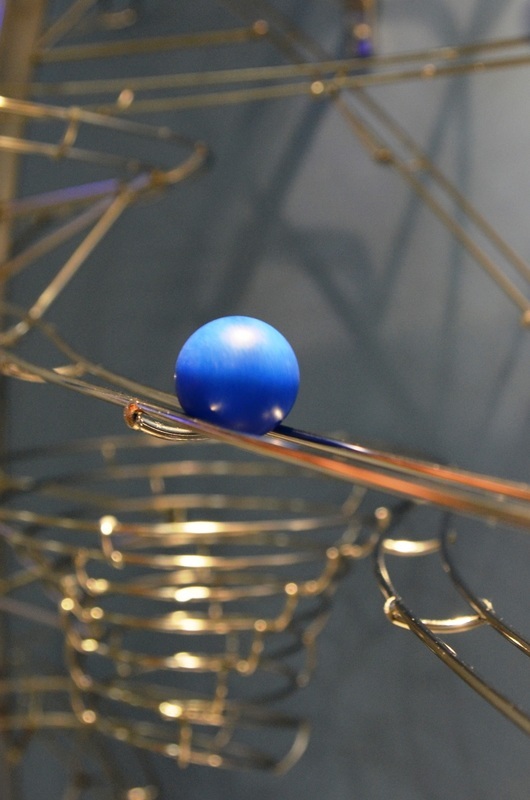 A blue ball rests on the polished stainless steel track. Details about the curved chain lift can be found in the Basic Lifting Mechanisms page.